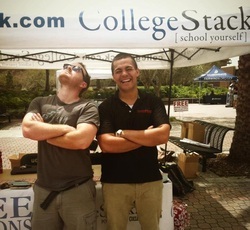 Here at College Stack we have a revolutionary franchising program that is available exclusively to college students. We are the only company that we know of which offers a no risk, full service approach to franchising. By becoming a franchisee you will gain access and insight to our entire business model as well as to resources and services to help your College Stack franchise succeed. If you are a current junior or senior studying business or entrepreneurship, please read our Franchise Information below. College Stack offers one of the most progressive franchise opportunities in the entire world. As a college oriented company we offer exclusive franchise opportunities for students and offer an amazing learning process for students. As a College Stack franchisee you will gain knowledge and insight into what it's like to run your own business. YOU are the boss and YOU own your franchise. We are here to provide you with support and help you grow your business. With low royalty fees and no start up costs, we offer college students a way to start and operate your own business. If you have always been interested in running your own business but haven't had the funds because of student loans and other expenses this is a great way to get started and to start your future today. College Stack has ridiculously low royalty fees and we offer a program with no startup fees. This means that you can start your own business without having to layout any of your own personal savings! We are the only company which offers college students a risk free opportunity to run their own businesses. Why are you qualified to run your own business? What drives you and why do you want to own your own business? Prior experience and what makes you a good franchise candidate? Why is your school a good place for a College Stack franchise? Your time commitment and why you believe you can run a College Stack franchise successfully? College Stack franchises last 1-year (2 semesters). Since you are your own boss you will be making money directly from your profits. We offer low royalty fees and all of the profit left over once your royalty fee is paid belongs to you! The harder you work to grow your business and run it successfully and efficiently, the more money you will make! Payments and royalty fees will be discussed more in detail if you are selected as a franchisee candidate.